I got my mom to write me a bit more about her regimen after she posted the gorgeous pictures below on facebook (yes my mom is on Facebook and an advanced internet user!). Somehow, despite not growing up this way, I became a product junkie and tend to do a lot of flying in the wind lol. My mom on the other hand, keeps it simple and has a lovely head of curls in her 50's. I further post this all as proof that at any age woman can look great with natural curls or kinks. She lives in Connecticut by the way, so it can be a bit harder to find support there. I’m all about basics (cheap) and chemical free (no color yet). Actually, I follow a lot of your advice, I just can’t afford the products. I wear my hair back and up and trim it myself about every 3 months. I keep it a good shoulder length because it’s more versatile for me at that length. When I find someone who can do a good curly cut I will wear it out more. 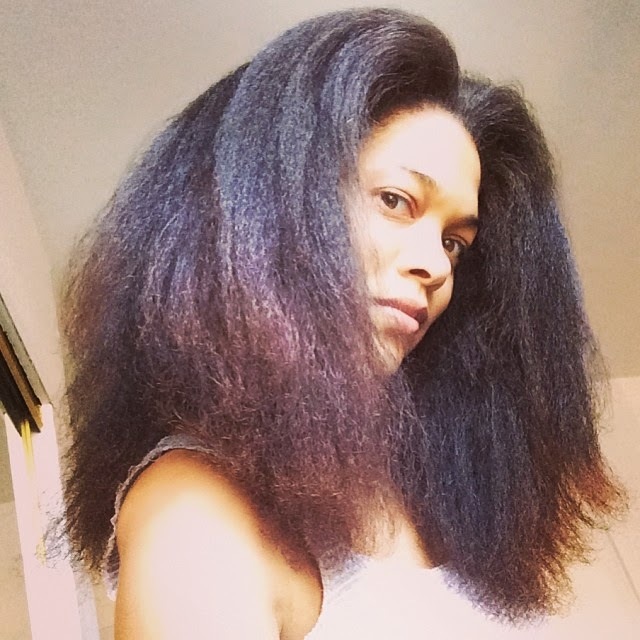 I use a wide tooth comb when I comb, never brush, use my fingers to fluff out my evening braids (the ends curl naturally because there is no perm left). When I want a slick back I use warm water and QP. I kind of miss brushing so I do scalp massage when I think about it (sometimes I do the brush with stocking when it’s dirty/straight and I need a quick “clean”...remember that? LOL) Because I haven’t been “stylin” there’s not much more to add.... no fuss here. I’m sent some pictures of products that I use. One last note, when I need to stretch my money I throw some virgin olive oil in my mixes because I always have that on hand. I keep tea tree oil on hand to throw in those blends. Sleek updo! I'm guessing from a large braid out. That's Akeela, her dog baby :-) Had to throw her in. Yes, she is a pitbull. YAY Moms! Your mom radiates beauty. so that's where you got your fantastic hair? your mom sounds like a wonderful woman and empowered internet user! Your mom is beautiful! thanks for sharing her story..I'm trying to get my mom into going natural again. Beautiful and very empowering to show that women can achieve curls (& individuality) and beautifulness at any age! Love it! Your mom looks great. I really enjoyed this one.